Dulles International Airport – Vinyasa is emptied, hauled out “on the hard,” and almost ready for winter. We won’t be back aboard until next June, so to improve air circulation and minimize the likelihood of mold, we stashed her contents in a climate-controlled storage unit in Annapolis. 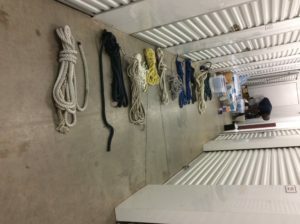 Getting to-and-from the unit – and organizing the contents – was time-consuming, but it was the closest available storage we could find. Sorting things out for storage. 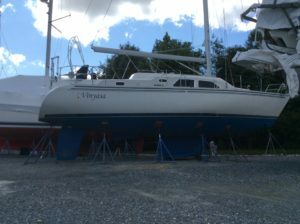 Work awaits us both tomorrow, so we outsourced the winterization of her systems, her Yanmar’s 1,000 hour maintenance, a needed anchor locker moisture issue repair, as well as some shrink wrap to be applied after the weather cools down in the fall. 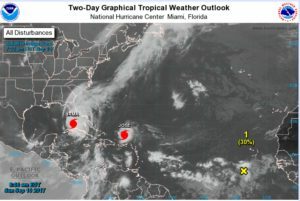 We fervently hope that this season’s devastating hurricanes stay far enough away. It has been heart-breaking to see so much devastation in Houston and the Caribbean, while we were on our delivery trip from Fort Lauderdale to Maryland. Today, we pray and hope for family and friends in Hurricane Irma’s path in Florida…and we look forward to moving aboard Vinyasa next summer. Hopefully, she will be just as we left her!